Social Media Win: Michael Flaherty Revamps His Twitter – Now Full of Engagement! Though blogging and social media are quite old now, many people still doubt it’s power. Well, what if I told you that a blog post here may have encouraged a Boston City Councillor and Mayoral Candidate to not only re-vamp their strategy, but to do so in just one day? Would you then begin to appreciate how social media (and that includes blogging) breaks down communication barriers and helps important issues bubble to the top and get fixed quickly? Because that might be the situation; just one day after my article from last week about how Michael Flaherty’s campaign failed to engage on Twitter, his Twitter stream began to become populated with @replies, RT’s and followees. It was a swipe at the Flaherty Twitter stream, which as of that article was following zero people and was broadcasting instead of communicating. Then, just one day later @mffboston09 began talking to us, instead of talking at us. And today, we see the Twitter handle following 240 people, talking to those people, and RTing others. Much better! Do note that now that he/his team is engaging with us I’m now following him. Did we sway a Boston mayoral candidate? When discussing the power of blogs to enact quick change in the political scene, we don’t need to see yes we can, instead we can proclaim yes we did! Sure, this revamping of Michael Flaherty’s Twitter profile may have been a pure coincidence and my blog post had nothing to do with it, but I think it played some role, even if it just re-affirmed to the campaign team that they needed to communicate, not broadcast. Note: After writing this post, Michael Flaherty’s Twitter profile responded to my inquiry and stated my article had nothing to do with the change in approach. But more importantly, it wasn’t just this blog post. It was you, the people who ReTweeted the post, shared it on Google Reader and linked to it. Thanks to all of you! While we’re at it, let’s send some commendations to Michael Flaherty and his campaign team for listening, improving, and engaging. The real moral of the story is that none of us are perfect. If we approach social media with an open mind, we can all learn how to improve ourselves and connect with the people around us better. Whether my post and your awareness helped drive this change or not, the change is a good thing and that’s what really matters. 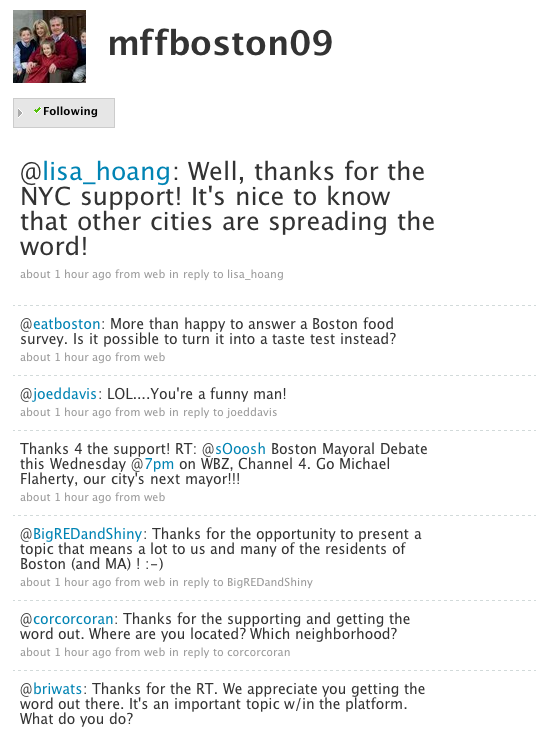 It’s a good thing for the City of Boston and its residents to have our mayor and mayoral candidates utilizing social media to communicate with Bostonians. Let’s hope this change is a small sign of things to come. Thanks to jungledrumsonline for the photo. Plausible deniability. Of course you were the impetus. We’ll never know for sure but the timing of their changes is quite a coincidence. Does that mean you believe everything happens for a reason OR that we shape our world to be how we want it to be, hence nothing is random? And yes, I realize that’s a bit of a meta-physical question, no worries if you’d rather leave it at what you already said. I believe in fate — but there are micro choices. But, considering the “turn around” happened so quickly after my post (just over 30 hours), I think it’s believable that the change was in the works before my post. Thanks for stopping by to give a bit more of the story. It is the power of blogging, very interesting story, I dont think it was a coincidence, Congrats! You touched the people hearts. I and they welcome any current suggestions you have. I hate to be that guy that doesn’t really add anything to the conversation. But I don’t have much to say other than “you go boy”. In reality though I can’t imagine you had nothing to do with it. Hard to imagine. Although I’m not sure how large a campaign ship that is to steer, meaning I’m not sure how quickly they would be able to react to a post like your earlier one.